Saint Barbara (Greek: Αγία Βαρβάρα, Coptic: Ϯⲁⲅⲓⲁ Ⲃⲁⲣⲃⲁⲣⲁ), Feast Day December 4, known in the Eastern Orthodox Church as the Great Martyr Barbara, was an early Christian Greek saint and martyr. Accounts place her in the 3rd century in Heliopolis Phoenicia, present-day Baalbek, Lebanon. There is no reference to her in the authentic early Christian writings nor in the original recension of Saint Jerome's martyrology. Despite the legends detailing her story, the earliest references to her supposed 3rd century life do not appear until the 7th century, and veneration of her was common, especially in the East, from the 9th century. "St Barbara" redirects here. For the company, see St Barbara (company). Saint Barbara is often portrayed with miniature chains and a tower. As one of the Fourteen Holy Helpers, Barbara continues to be a popular saint in modern times, perhaps best known as the patron saint of armourers, artillerymen, military engineers, miners and others who work with explosives because of her legend's association with lightning, and also of mathematicians. A 15th-century French version of her story credits her with thirteen miracles, many turn on the security she offered that her devotees would not die before getting to make confession and receiving extreme unction. According to the hagiographies, Barbara, the daughter of a rich pagan named Dioscorus, was carefully guarded by her father who kept her locked up in a tower in order to preserve her from the outside world. Having secretly become a Christian, she rejected an offer of marriage that she received through her father. Before going on a journey, her father commanded that a private bath-house be erected for her use near her dwelling, and during his absence, Barbara had three windows put in it, as a symbol of the Holy Trinity, instead of the two originally intended. When her father returned, she acknowledged herself to be a Christian; upon this he drew his sword to kill her, but her prayers created an opening in the tower wall and she was miraculously transported to a mountain gorge, where two shepherds watched their flocks. Dioscorus, in pursuit of his daughter, was rebuffed by the first shepherd, but the second betrayed her. For doing this, he was turned to stone and his flock was changed to locusts. 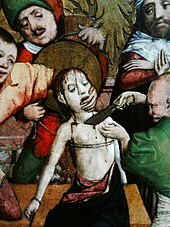 Dragged before the prefect of the province, Martinianus, who had her cruelly tortured, Barbara held true to her Christian faith. During the night, the dark prison was bathed in light and new miracles occurred. Every morning, her wounds were healed. Torches that were to be used to burn her went out as soon as they came near her. Finally, she was condemned to death by beheading. Her father himself carried out the death-sentence. However, as punishment, he was struck by lightning on the way home and his body was consumed by flame. Barbara was buried by a Christian, Valentinus, and her tomb became the site of miracles.This summary omits picturesque details, supplemented from Old French accounts. According to the Golden Legend, her martyrdom took place on December 4 "in the reign of emperor Maximianus and Prefect Marcien" (r. 286–305); the year was given as 267 in the French version edited by Father Harry F. Williams of the Anglican Community of the Resurrection (1975). The name of Saint Barbara was known in Rome in the 7th century; her cult can be traced to the 9th century, at first in the East. Since there is no mention of her in the earlier martyrologies, her historicity is considered doubtful. Her legend is included in Vincent of Beauvais' Speculum historiale (xii.64) and in later versions of the Golden Legend (and in William Caxton's version of it). Various versions, which include two surviving mystery plays, differ on the location of her martyrdom, which is variously given as Tuscany, Rome, Antioch, Baalbek, and Nicomedia. Saint Barbara is one of the Fourteen Holy Helpers. Her association with the lightning, which killed her father has caused her to be invoked against lightning and fire; by association with explosions, she is also the patron of artillery and mining. Her feast on December 4 was introduced in Rome in the 12th century and included in the Tridentine Calendar. In 1729, that date was assigned to the celebration of Saint Peter Chrysologus, reducing that of Saint Barbara to a commemoration in his Mass. : 98 In 1969, it was removed from that calendar, because the accounts of her life and martyrdom were judged to be entirely fabulous, lacking clarity even about the place of her martyrdom. : 147 But she is still mentioned in the Roman Martyrology, which, in addition, lists another ten martyr saints named Barbara. In the 12th century, the relics of Saint Barbara were brought from Constantinople to the St. Michael's Golden-Domed Monastery in Kyiv, where they were kept until the 1930s, when they were transferred to St. Volodymyr's Cathedral in the same city. In November 2012, His Holiness Patriarch Filaret of The Ukrainian Orthodox Church – Kiev Patriarchate brought a small part of St. Barbara's relics to St. Andrew Ukrainian Orthodox Cathedral in Bloomingdale, Illinois. Her feast day for Roman Catholics, and Anglicans is December 4. Saint Barbara is venerated by Catholics who face the danger of sudden and violent death at work. She is the patron of miners, tunnellers, armourers, military engineers, gunsmiths, and anyone else who worked with cannon and explosives. She is invoked against thunder and lightning and all accidents arising from explosions of gunpowder. She became the patron saint of artillerymen. The Spanish word santabárbara, the corresponding Italian word Santa Barbara, and the obsolete French Sainte-Barbe signify the powder magazine of a ship or fortress. It was customary to have a statue of Saint Barbara at the magazine to protect the ship or fortress from suddenly exploding. Saint Barbara is the patron of the Italian Navy. Saint Barbara is the Patron Saint of the Gunnery Branch of the British Royal Navy. The church at HMS Excellent (also known as Whale Island) Portsmouth, Hampshire, England, the former Gunnery School of the Royal Navy, is called St. Barbara's. 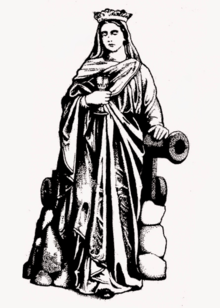 The Irish Army venerates her as the patron saint of the Artillery Corps where she appears on the corps insignia, half dressed, holding a harp, sitting on a field cannon. Saint Barbara’s Day, December 4, is celebrated by the British (Royal Artillery, RAF Armourers, Royal Engineers), Australian (Royal Regiment of Australian Artillery, RAAF Armourers), Canadian (Explosive Ordnance Disposal Technicians (EOD), Canadian Air Force Armourers, Royal Canadian Artillery, Canadian Military Field Engineers, Royal Canadian Navy Weapons Engineering Technicians), and New Zealand (RNZN Gunners Branch, RNZA, Royal New Zealand Army Ordnance Corps, RNZAF Armourers) armed forces. It is celebrated by the Norwich University Artillery Battery with a nighttime fire mission featuring multiple M116 howitzers. Saint Barbara's Day is celebrated by United States Army and Marine Corps Field and Air Defense Artillery, many Marine Corps Explosive Ordnance Disposal Technicians. The units and sub-units celebrate the day with church parades, sports days, guest nights, cocktail parties, dinners and other activities. Several mining institutions also celebrate it, such as some branches of the Australian Institute of Mining and Metallurgy. The West Australian Mining Club celebrate St Barbara's Day and use it to remember those people who have died working in the mining industry during the year. Although they do not celebrate her saint's day, she is also the patron saint of US Navy and Marine Corps Aviation Ordnancemen. In the mining town Kalgoorlie, Australia, as patron saint of miners she is venerated in the annual St. Barbara's Day parade. Barbara shrines in the German mines Schacht Konrad (left) and Schacht Asse II (right). In Germany, Saint Barbara is revered as a patron saint of miners and in extension, the geosciences in general, including the tunelling industry . This connection is particularly strong in the Catholic areas of Germany, as for example Bavaria. Some university geology departments hold annual 'Barabarafests' if not on the 4th then the closest Friday, or within Baden Würtemberg, see Universität Tübingen or Universität Freiburgor Universität Bonn or applied geosciences of the Technische Universität Darmstadt in Hesse. In the Czech Republic, a statue of Saint Barbara is placed near the future tunnel portal during the groundbreaking ceremony of most major tunneling projects, owing to her being the patron saint of miners. A portion of the coast of California, now occupied by the city of Santa Barbara, California and located approximately 100 miles northwest of Los Angeles, is named after her. It was given the name in 1602, after a maritime explorer, Sebastián Vizcaíno, survived a violent storm just offshore on the eve of her feast day. A Roman Catholic missionary church, the Mission Santa Barbara, was founded there on her feast day in 1786, and is one of the twenty-one such churches that were operated by the Franciscan Order and collectively known as the California missions. The Presidio of Santa Barbara was built in 1782, with the mission of defending the Second Military District in Spanish California. Santa Barbara County was one of the twenty-seven original counties of California, formed in 1850 at the time of statehood. The county's territory was later divided to create Ventura County in 1873. Other Spanish and Portuguese settlements named Santa Barbara were established in Brazil, Chile, Colombia, Honduras, Mexico, Venezuela, and the Philippines. Many churches in Russia are dedicated in her name, including one in Moscow, next to Saint Basil's Cathedral, and in Yaroslavl. In the Afro-Cuban religion of Santería she is syncretized with Chango, the deity of fire, lightning, and thunder. In Afro-Brazilian religions of Candomblé and Umbanda, she is often identified as Yansan, the orisha of wind and storms. In Georgia, Saint Barbara's Day is celebrated as Barbaroba on December 17 (which is December 4 in the old style calendar). The traditional festive food is lobiani, bread baked with a bean stuffing. In Macedonia Saint Barbara's day is celebrated by the Orthodox, as Варвара (Varvara) on 17 December. Some Macedonians celebrate with their closest family and friends at home, while others refrain, believing that people who step in their house on Saint Barbara's day will give them either good or bad luck for the rest of the year. In Armenia, a cave shrine to Saint Barbara (Kuys Varvara) is located on the slopes of Mount Ara and lit candles and flower garlands are used as tribute. Eid il-Burbara or Saint Barbara's day is celebrated in Lebanon, Syria, Jordan and Palestine, Israel among Arab Christians annually on December 4, in a feast day similar to that of North American Halloween. The traditional food for the occasion is Burbara, a bowl of boiled barley, pomegranate seeds, raisins, anise and sugar. Walnuts or almonds can be added. The general belief among Lebanese Christians is that Saint Barbara disguised herself in numerous characters to elude the Romans who were persecuting her. There are two levels of membership in the order. The Honorable Order of St. Barbara, a silver medallion with red ribbon, is granted for long-term distinguished service in the Field Artillery or Air Defense Artillery corps. Appointment to the Honorable Order may be approved by the first colonel or the seniormost lieutenant-colonel in the chain of command. The most distinguished level is The Ancient Order of Saint Barbara, a gold-colored medallion with red ribbon. Those who are selected for this honor have achieved long-term, exceptional service to the field artillery surpassing even their brethren in the Honorable Order of Saint Barbara. The Ancient order must be approved of by the Commanding General, United States Army Fires Center of Excellence at Fort Sill. The name of the barbiturate family of pharmaceutical drugs is believed to derive from the suggestion by an artilleryman commemorating the feast of Saint Barbara in 1864, whom the chemist Adolf von Baeyer encountered at a local tavern whilst celebrating his recent discovery of the parent compound. Saint Barbara is mentioned in Thomas Pynchon's novel Against the Day. The December fourth holiday is compared to the Fourth of July, as being more celebrated by the Dynamiters. Blessed Santa Barbara, / Your story is written in the sky, / With paper and holy water. The first Spanish-language Telenovela filmed in color for TV in the US, was the 1973 production of Santa Bárbara, Virgen y Mártir, filmed entirely on location in Hialeah, Florida. GK Chesterton wrote the Ballad of Saint Barbara, interweaving the Legend of the Saint with the contemporary account of the huge artillery barrages that turned the First Battle of the Marne. Major Barbara is a play by George Bernard Shaw in which the title character is an officer in the Salvation Army and grapples with the moral dilemma of whether this Christian denomination should accept donations from her father, who is an armaments manufacturer. In "Time Bomb," an episode of The Closer, the LAPD deploy a bomb-squad robot named Babs, after St. Barbara in her role as patron saint of artillery and explosives personnel. Saint Barbara's story is mentioned in a live version of The Hold Steady's song "Don't Let Me Explode" from Lollapalooza. Saint Barbara is usually depicted in art as standing by a tower with three windows and two tables with any chair, carrying a palm branch and a chalice, sometimes with cannons depicted by her side. A Greek Orthodox icon of Saint Barbara. An altar at St. Verena's Catholic Church in Roggenbeuren depicting Saint George and Saint Barbara. St Barbara Directing the Construction of a Third Window in Her Tower, by the Master of the Joseph Sequence. The Martyrdom of St Barbara, by the Master of the Joseph Sequence. Drolet, Jean-Paul (1990). Sancta Barbara, Patron Saint of Miners: An Account Drawn from Popular Traditions. Québec: J.-P. Drolet. OCLC 20756409. Graffy de Garcia, Erin (1999). Saint Barbara: The Truth, Tales, Tidbits, and Trivia of Santa Barbara's Patron Saint. Santa Barbara, CA: Kieran Pub. Co. ISBN 9780963501813. Haas, Capistran J. (1988). Saint Barbara, Her Story. Santa Barbara, CA: Old Mission. OCLC 183447944. Holy Great Martyr Saint Barbara: Who Was Killed by Her Own Father for Her Faith in Christ. Lives of saints, v. 5. St Marys, N.S.W. : Holy Dormition Sisterhood. 2004. OCLC 224359179. Wikimedia Commons has media related to Saint Barbara. ^ Ulysses Annotated: Notes for James Joyce's Ulysses, D. Gifford, Robert J. Seidman, University of California Press, 2008, ISBN 0520253973, p. 527. ^ a b c d e Harry F. Williams, "Old French Lives of Saint Barbara" Proceedings of the American Philosophical Society 119.2 (16 April 1975:156–185), with extensive bibliography. ^ Alexander Joseph Denomy, "An old French life of Saint Barbara", Medieval Studies 1 (1939:148–78) publishes a 13th- or 14th-century poem in octasyllabic couplets; Wilhelm Weyh, Die syrische Barbara-Legende (Schweinfurt, 1912), concludes that the first legenda was in Greek. ^ B. de Gaiffier Analecta bollandiana77 (1959)5–41, suggests that the Legenda Aurea version was inspired by one from the late 15th-century Augustinian Jean de Wackerzeele, also known as Jean de Louvain (noted by Williams 1975:1758 note 17. ^ Bulfinch, (2001). One Hundred Saints. Boston, MA: Little, Brown and Company. ^ a b Shaver, Katherine (2018-12-27). "As workers toil underground, Saint Barbara keeps watch". Washington Post. Retrieved 2018-12-27. ^ "Saint Barbara Nomination" (PDF). USFAA. Retrieved 2007-12-25. ^ a b "St. Barbara". Catholic Online. Retrieved 4 December 2018. ^ "Saint Barabara". Saint Barabara Parish. Retrieved 2008-03-07. ^ a b Kinard, Jeff (2007). Artillery : an illustrated history of its impact. Santa Barbara: ABC-CLIO, Inc. ISBN 9781851095612. ^ a b Caprio, Betsy (1982). The Woman Sealed in the Tower—Being a View of Feminine Spirituality As Revealed by the Legend of Saint Barbara. New York: Paulist Press. ISBN 9780809124862. ^ "Santa Barbara watches over tunnellers". tunneltalk.com. Retrieved 4 December 2018. ^ "London: Crossrail workers seek protection of Saint Barbara". Independent Catholic News. Retrieved 3 December 2013. ^ "The Ecumenical Sacred Lexicon (ÖHL)". ^ "American Geophysical Union publication: Medieval Saint Barbara Worship and Professional Traditions in Early Mining and Applied Earth Science". ^ "International Commission on the History of Geological Sciences, page 38" (PDF). ^ "Barbarafest 2018 - Maskenball Venedig". University of Tübingen. Retrieved 3 December 2018. ^ "Barbarafest 2013". Universität Freiburg. 26 November 2018. Retrieved 3 December 2018. ^ fachschaft.uni-bonn. "Steinmann Student Union". Archived from the original on 2018-12-01. Retrieved 3 December 2018. ^ Institut für Angewandte Geowissenschaften der Technischen Universität Darmstadt. (7 December 2018). "Barbarafeier am 07.12.18 im Schlosskeller". dubistgeologie.wordpress.com. Retrieved 3 December 2018. ^ 1850 Calif. Stats., Chap. 15, § 4. ^ "Ventura County: Historical Landmarks and Points of Interest" (PDF). County of Ventura, General Services Agency. p. xiii. Retrieved January 1, 2016. ^ Hammond Atlas of the World. 1997. ^ "Saint Barbara's Day in Georgia, December 17". Messenger.com.ge. 2007-09-28. Retrieved 2014-08-22. ^ "Cyprus Army notes on Saint Barbara". Army.gov.cy. Retrieved 2014-08-22. ^ Gervers, Michael; Bikhazi, Ramzi Jibran (1990). Conversion and Continuity: Indigenous Christian Communities in Islamic Lands Eighth to Eighteenth Centuries. Pontifical Institute of Mediaeval Studies. ISBN 9780888448095. ^ Terry Carter. Syria and Lebanon. p. 66. ISBN 1-86450-333-5. ^ Wilhelmina and George Baramki (February 2007). "Winter Traditions in Palestine". Issue 106. Retrieved 2008-12-04. ^ "United States Field Artillery Association". fieldartillery.org. Retrieved 23 January 2010. ^ "cse.dmu.ac.uk". cse.dmu.ac.uk. 2005-01-10. Retrieved 2014-08-22. ^ Albert, Sidney P. (May 1968). ""In More Ways than One": "Major Barbara"'s Debt to Gilbert Murray". Educational Theatre Journal. 20 (2): 123–140. JSTOR 3204896. Herbermann, Charles, ed. (1913). "St. Barbara" . Catholic Encyclopedia. New York: Robert Appleton Company. Chisholm, Hugh, ed. (1911). "Barbara, Saint" . Encyclopædia Britannica. 3 (11th ed.). Cambridge University Press.